Published in Neue Luxury, Issue 6, 2016. It was during his high school years in Montana that Lonney White became “confused by the trendiness of colour” and shunned the palette entirely from his sartorial identity. He was instead solaced by the timeless allure of monochrome, with the stylistic code since creeping into his aesthetic as a neo-minimalist painter, sculptor and furniture designer. Guided by an intuitive current, White uses the techniques of moulding, fusing and spilling to transform metal, bronze, steel, concrete and wax into pieces that bring to mind extraterrestrial surfaces and flattened exoskeletons. During the sculpting and pouring process, the artist often welcomes the “erratic behaviours” carried by these mercurial elements, and chooses to expose, instead of smooth over, the indentations, holes and other surprises that may surface. “My materials are sourced from all sorts of places,” White says of his Frankenstein assemblage. For his bronze fabrications he uses a local foundry called West Supply, while a different supplier provides the metal alloys for his paintings, and another for his steel. This year he visited a sheep farm outside of Chicago to source wool for his wet-felting. While he describes his works as “subdued and non-representational”, with primitive titles devoid of fanfare, he enjoys hearing the Rorschachian thoughts offered by viewers. “Someone recently told me my paintings looked like sea lily fossils,” which he says is plausible, given the works resemble relics “once alive” due to an animated molten process. 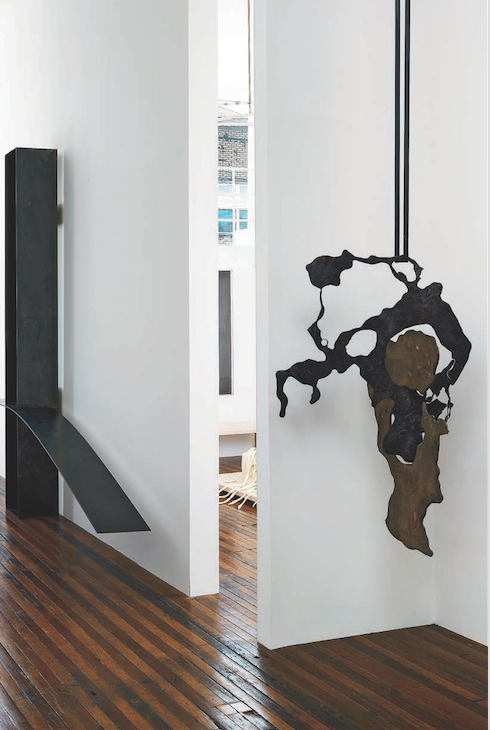 Image: Sculpture made from steel and bronze, displayed at the home of Lonney White and Lukas Machnik. Image by Jack Shneider.